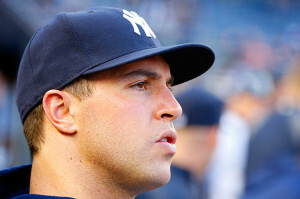 The little lingering chance of season ending surgery appears to be a painful reality for New York Yankees first baseman and slugger Mark Teixeira. With the trade deadline just over a month away, it is now apparent the Yankees will be on the hunt for a first baseman as Lyle Overbay struggles against lefties and David Adams has not been able to cut it in the majors offensively so far. For Tex, it has been recommended he seek surgery as the final option for repairing his right wrist, the same wrist he initially injured the first day of spring training with the USA World Baseball Classic team. With the surgery will come the end of Teixeira’s season, a year mostly lost due to injury except for a string of games where the switch-hitter struggled to hit over .150. On a more positive note, Eduardo Nunez has been cleared to begin a rehab assignment (presumably through Brian Cashman first) and will play Wednesday in High A Tampa. Nunez was slated as the Opening Day shortstop once Derek Jeter was officially not cleared to start the year and expectations were raised when Jeter rebroke his ankle. Nunez instead struggled in April and has been on the DL since May 6th with a mysterious oblique injury. While he has suffered multiple setbacks himself, if all goes well Nunez could return to the Yankees next week, pushing Jayson Nix over to third and leaving David Adams out of the everyday lineup. Those moves alone could help the Yankees for around a month before Jeter, Alex Rodriguez and Curtis Granderson may all return from various injuries.